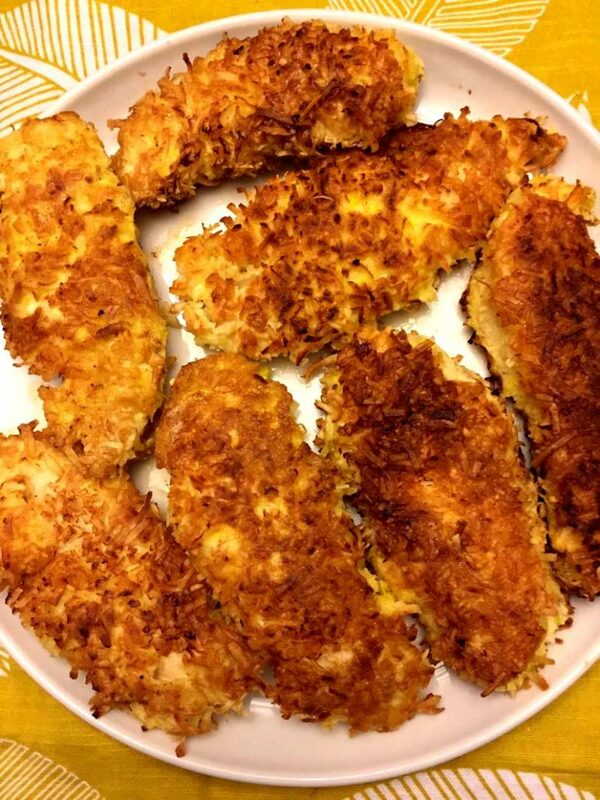 The taste of breaded chicken without all the carbs, this crispy coconut chicken tenders recipe is mouthwatering! With a crunchy outside and tender, juicy chicken inside, these keto chicken tenders are amazing! I love chicken tenders. Who doesn’t? But if you’re following a keto diet, maybe you miss the delicious crunch of a perfectly cooked crispy chicken tenders. Maybe you’re gluten-free and have been craving breaded chicken? 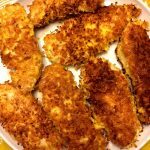 This recipe for Coconut Chicken Tenders is keto and gluten-free, but it is also absolutely satisfying and delicious. If you are wondering how you can make chicken tenders that meet those dietary needs, look no further! This recipe uses unsweetened coconut flakes as a breading for chicken. This was a totally new idea for me but comes out so delicious. 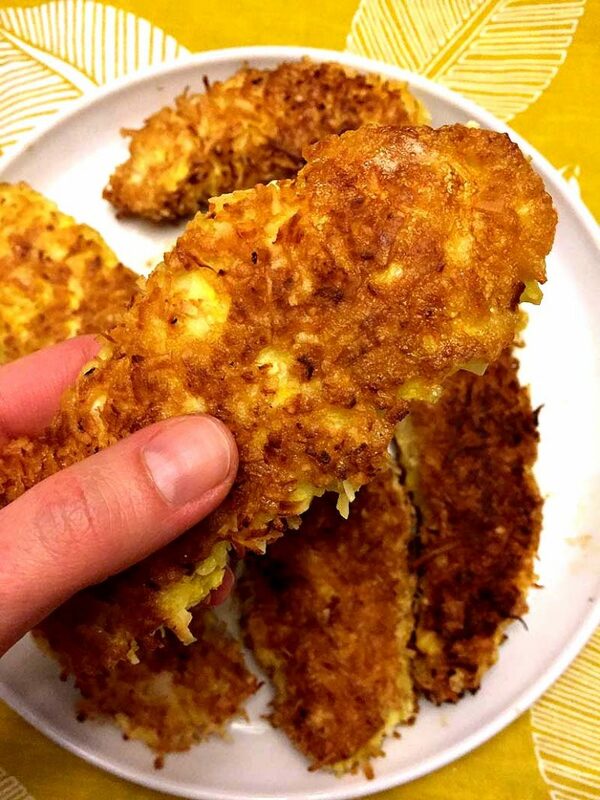 The flakes give these Coconut Chicken Tenders a great texture – perfectly crispy and crunchy. I wish I had more adjectives to describe these tenders… crisp, savory, juicy, tender, delectable, exquisite. Take your pick! With a crunchy outside and tender inside, this chicken hits so many of the textures and flavors we all love. To make these chicken tenders, you’ll dip chicken tender pieces in egg on both sides. 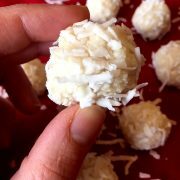 Next, you’ll dip each piece in coconut flakes (make sure to purchase unsweetened coconut flakes). 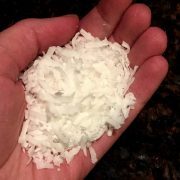 Take that chicken back for a second dip in the egg and then another dip into the coconut flakes. Once you’re done, place your coated chicken into oil in a hot frying pan. Make sure to do this in a single layer so your chicken tenders are not touching each other. 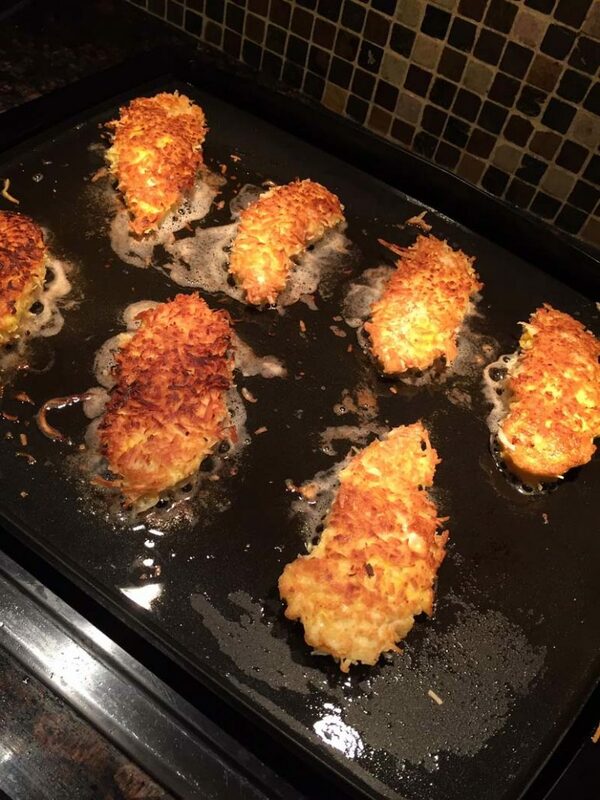 Cook your coconut-crusted chicken tenders for four minutes on each side. 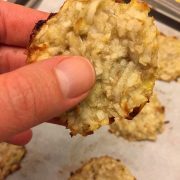 Flip them over and cook for four more minutes. 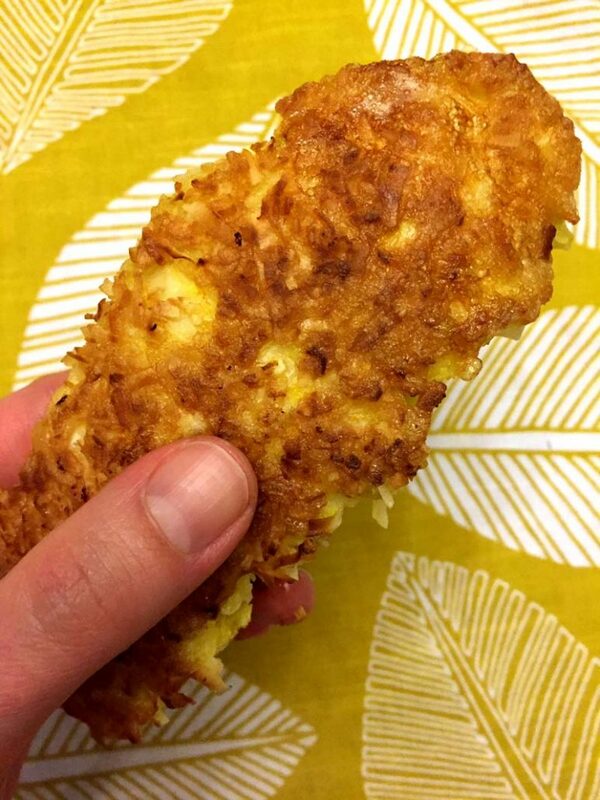 The double coating and hot oil creates the perfect crispy crust on these Coconut Chicken Tenders. 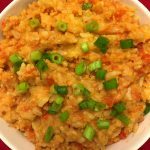 Chicken is a popular meat option, but if you’re like me it can be easy to get into a rut. These tenders are a great alternative to baked chicken. There is no need for chicken boredom and flavorless tenders. Using this Coconut Chicken Tender recipe gives you delicious, crunchy chicken tenders that are flavorful and delicious. They meet diverse dietary needs but also taste great! I love the texture of these tenders, especially when dipped in a delicious sauce. All this talk about these Coconut Chicken Tenders has my mouth watering. It is that delicious crunch that really knocks it out of the park for me! Excuse me while I head directly to my kitchen to whip up a batch of these delicious tenders! 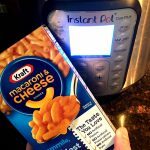 Best Ever Keto Bread– this is the only keto bread recipe you’ll ever need! It tastes like real bread! You just have to see it to believe it! Keto Ricotta Cake – this is a great breakfast cake, if you are tired of eggs for breakfast, you are going to love this! Keto Cheddar Chips – you can taste the cheddar in every crunch! Keto Meatballs – who needs breadcrumbs? These keto meatballs are so easy to make and omit the bread! Keto Peanut Butter Cups – can you imagine Reese’s peanut butter cups without all the sugar? You’ve got it! 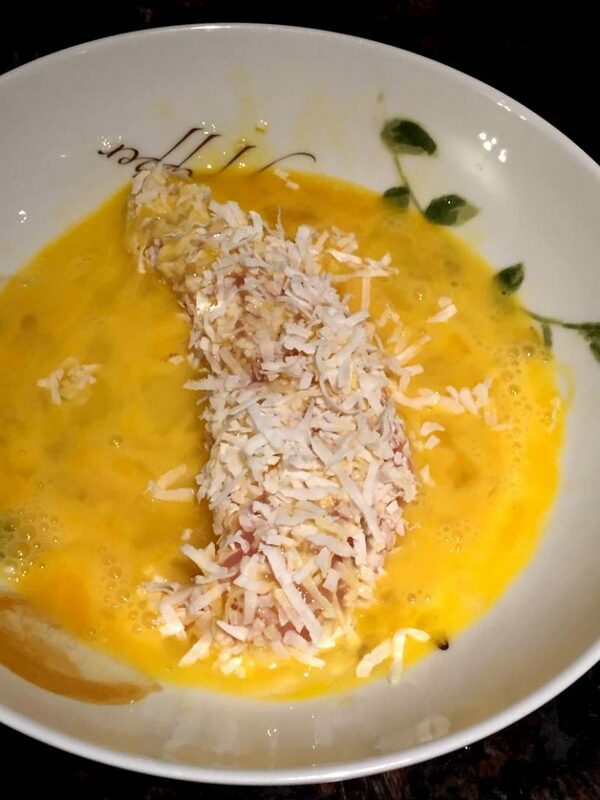 These coconut chicken tenders are amazing! This is like breaded chicken without the carbs! 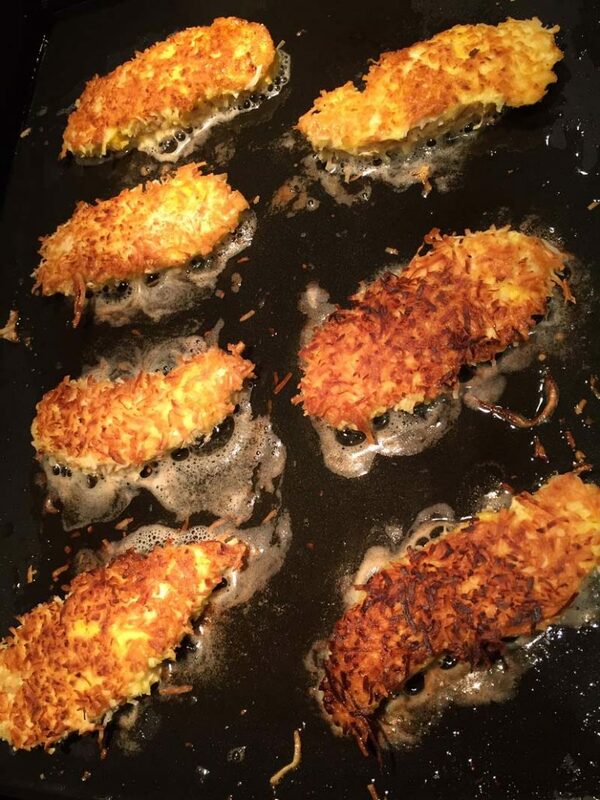 Crispy coconut crust on the outside, tender and juicy chicken inside - mouthwatering! Crack the eggs into a bowl and whisk with a fork. 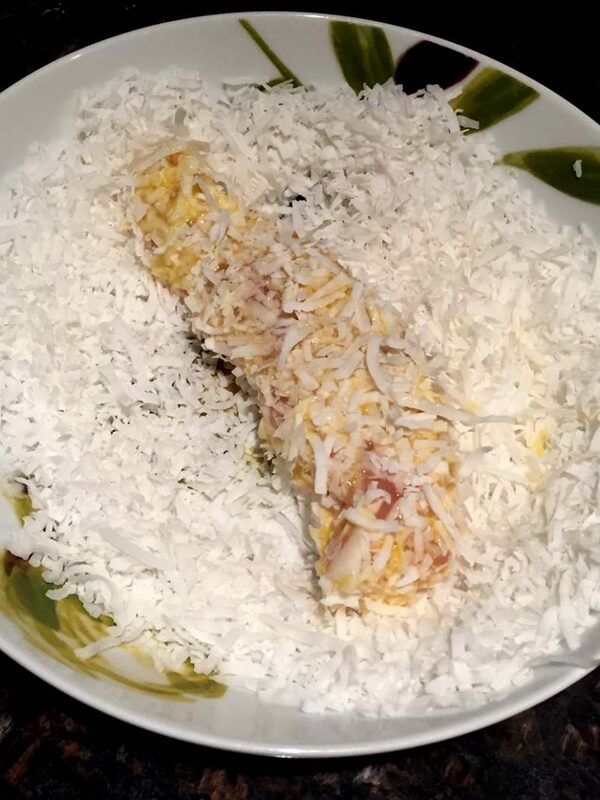 Put the coconut flakes on a plate. Sprinkle the chicken tenders with salt and pepper. 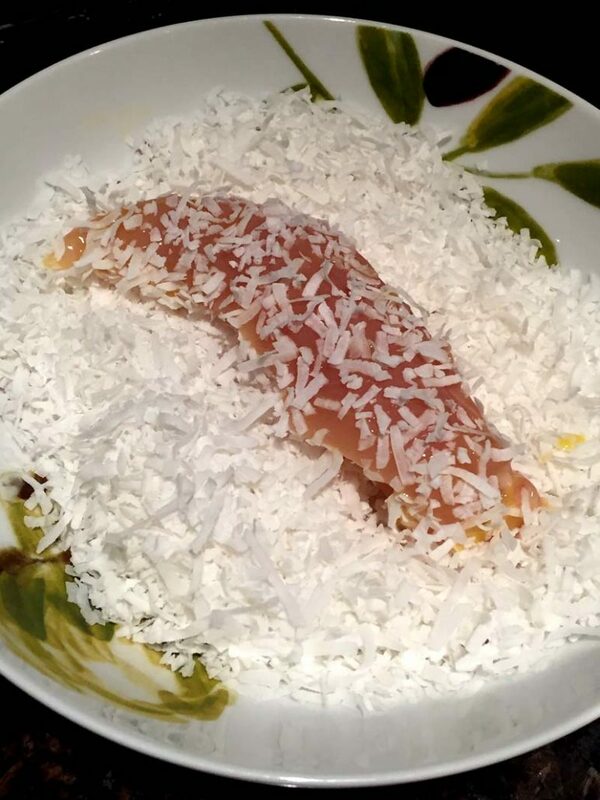 Dip each chicken tender in egg on both sides, then in coconut flakes on both sides, then again in egg on both sides and the second time in coconut flakes on both sides. 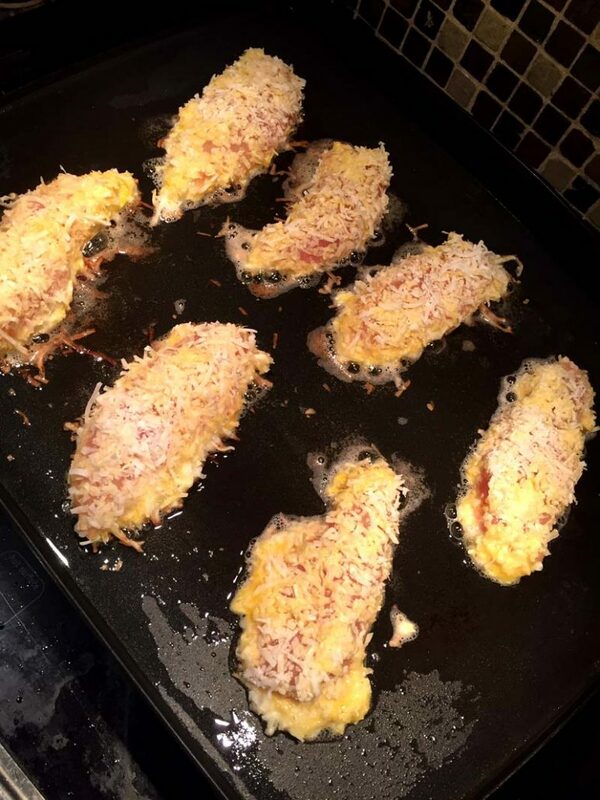 After the chicken tenders are dipped in egg and coconut flakes two times, put them on a frying pan in a single layer, so they are not touching. 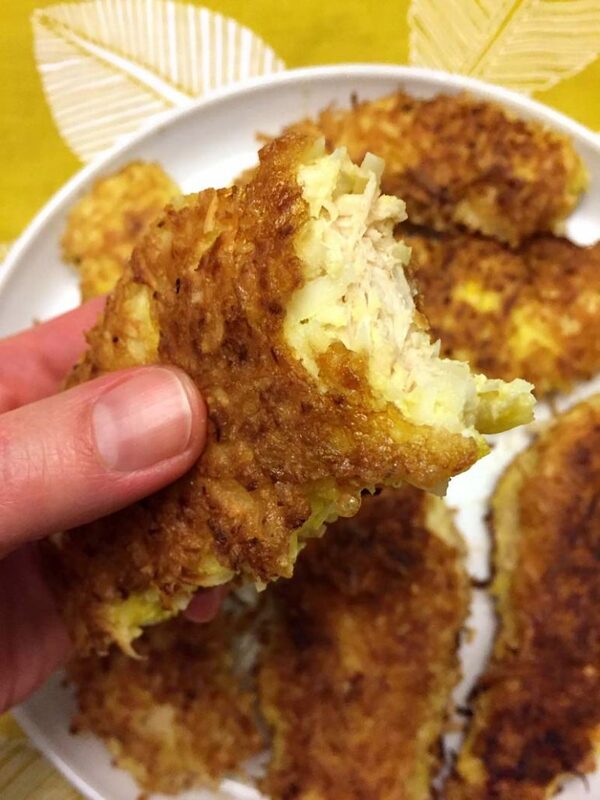 Cook coconut-crusted chicken tenders for 4 minutes on one side, then flip with a spatula and cook for 4 more minutes on another side (or until completely cooked through and no longer pink in center). 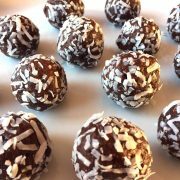 Healthy Coconut Date Truffles - Sugar-Free, Gluten-Free, Raw, Vegan Energy Balls!